It’s trick or treat time for most, but we’re all about treats here. We’re giving away an annual subscription to finance software Hurdlr to one FWJ reader. No doubt you’ve heard of “experience vacations” or “experiences packages”. It’s no surprise that they’ve become popular in recent times. You can choose whatever experience you prefer, or you can gift a package to your friends, loved ones, and colleagues – all the while giving them the freedom of choosing what they actually want to do. Move over ugly Christmas sweaters and unwanted trinkets! Xtra-PC Gives New Life to Your Old PC, and We’re Giving 5 Units Away! Who wouldn’t love buying a new computer every year or every time something new (and better) comes out? If you think about it, spending money on a new computer is an investment. In our line of work, that device is the money-maker. Without a computer, we can’t work. However, we don’t all have the luxury of being able to purchase a new one regularly. Sometimes, we even have to bear with a dinosaur of a computer which bogs down at the worst possible moment. 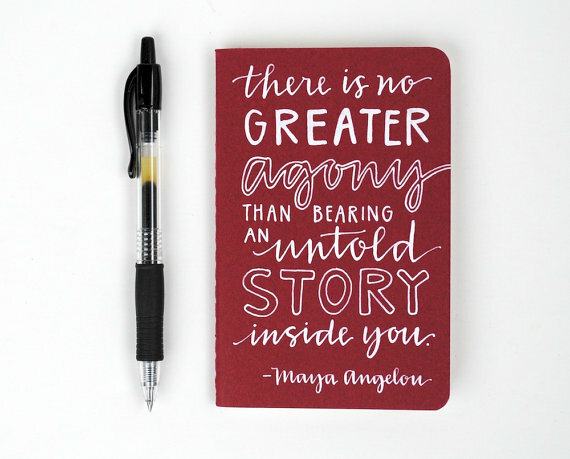 Win a Hand-Lettered Mini Journal With a Maya Angelou Quote! It’s been a while since we had a giveaway, hasn’t it? It’s not every day that we come across generous people who want to share their beautiful – and useful – work with others, but Emily of EmDashPaperCo is giving away one of her hand-lettered mini journals. Not only will it be very useful to any writer, it also has a a very apt quote, which I hope will serve as inspiration. I don’t know about you, but I would love to have this particular piece of work in my bag! That looks nice, doesn’t it? Here’s more information about the mini journal. It’s small enough to take with you wherever you go, so you can jot down your thoughts for all those lightbulb moments. Just follow the instructions in the widget below. You can tweet every day to earn more entries, and you have to be a US resident to qualify. We will choose the winner at random on Friday, February 22, around 10PM EST. Good luck! 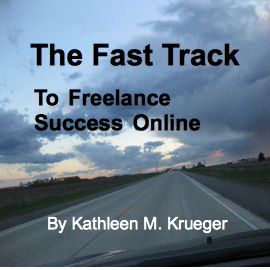 Win a Free Copy of Kathleen Krueger’s “The Fast Track to Freelance Success Online”! Many of you have been working online for quite some time, but I am sure that we also have a good number of readers who are only starting to wade in the freelance waters. Whichever group you belong to, I think that you will benefit a lot from reading Kathleen Krueger’s recently released e-book, “The Fast Track to Freelance Success Online”. Kathleen is one of our readers, and I was made aware of her book when she left a comment a week or so ago, and guess what? She has generously agreed to give away two copies! The title gives you a pretty good idea what the book has to offer, but let me tell you this: it is a pretty good handbook for anyone who wants to launch a freelance career and be successful without waiting ages. The book is divided into seven chapters, starting with identifying your goals, moving on to how to begin, and ending with an update on Kathleen’s professional status. What Kathleen does, instead, is to share the lessons and nuggets of wisdom she has learned in her own journey to freelancing success. And, I have to say that this book should be mandatory reading for anyone who wants to succeed in this field. Here is some more information about Kathleen that you might want to know. Kathleen is a full time freelance writer from Minnesota with a creative, casual style. Currently she contributes articles to several local and national lifestyle magazines; is a writer of informational online articles regarding a wide range of topics; ghost writer for several company blogs and website content in a wide range of industries. Now, would you like to read the ebook that can help you with your freelancing career? As I said earlier, we’re giving away TWO copies. Here’s what you need to do to get a chance to win. The winners will be selected at random from the commenters on or around 11:00 pm EST on Wednesday, September 26. The winners will be notified via Twitter, after which we’ll get your details. Don’t forget to thank @kacky222 if you win! Important: You can enter the contest once per day between now and the 26th. In case you don’t win, you can still get The Fast Track to Freelance Success Online for only $4.50. In the meantime, remember to tweet and leave your comments till Wednesday! Who Wants to Win This Ray Bradbury Mug? I don’t know about you, but this is one of my favorite quotes from a writer. While I have to be honest and say that I am not a huge Ray Bradbury fan (not because I don’t like his work, but simply because I haven’t had the chance to read much of it), this line just hits home at times. When I saw this mug on Etsy, I had a feeling that some of you guys might want to get your hands on it as well. Not only is the design something we can relate to as writers, the mug can also easily become a constant companion. I think I am not wrong in assuming that a cup of coffee or tea is never far from reach, am I? Lucky for us, the creator of this mug is a writer herself, and she has generously agreed to give it away to a lucky FWJ reader! Well, technically, it won’t be the same mug that Hanna is giving away because she is going to make one especially for this giveaway, but that should not be an issue, should it? 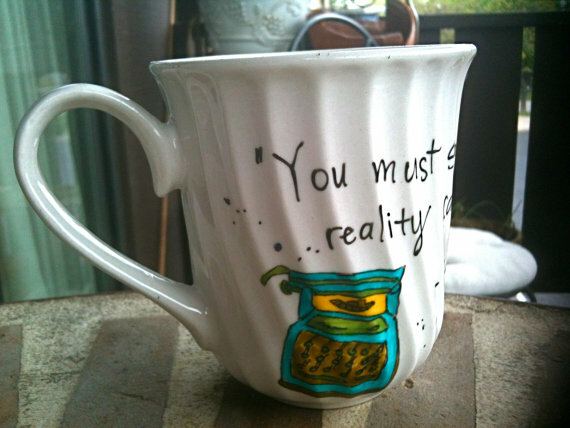 Before we go to the contest guidelines, I suggest visiting Hanna’s Etsy shop, Ophelia’s Gypsy Caravan, where you will find so many more hand-painted mugs. If you’re anything like me, who can’t have enough coffee mugs around the house, then you are in for a treat! Now how do you join this contest? Here are the steps. The winner will be selected at random from the commenters on or around 10:00 pm EST on Thursday, July 5. The winner will be notified via Twitter, after which we’ll get your details for shipping. Don’t forget to thank @hannachoward if you win! Important: You can enter the contest once per day between now and the 5th. Also, due to shipping considerations, the winner will have to be based in the United States. I am sure that I am not alone in feeling nostalgic about the entire experience of putting words on paper (literally) using a typewriter. As a kid, I would alternate between the desire to daintily tap on the keys and the urge to pound away like a crazed writer. 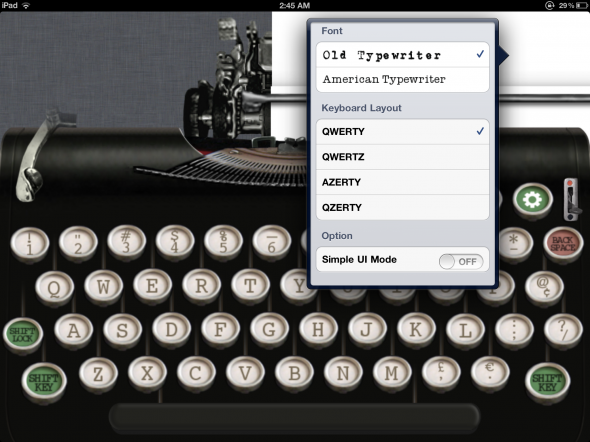 It might be a difficult thing to find real typewriters nowadays, but for those of you who have an iPad, here’s the next best thing: miTypewriter. This app turns your iPad into something like the typewriters of old, and while you won’t have the tactile experience, the looks and sounds certainly provide an enjoyable trip down memory lane. miTypewriter looks like this. You can tweak the settings to suit your fancy. And once you have typed out your letter, article, or whatever it is you are working on, you have a few options to choose from as well. Once you’re done, you can even print out your letter. 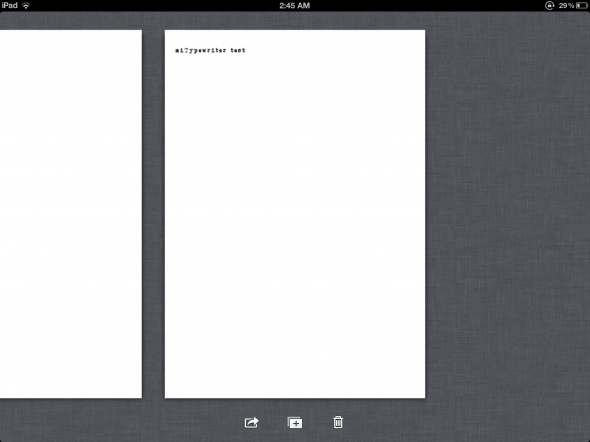 Doesn’t that make you want to have miTypewriter on your iPad? That’s what we’re here for: to give you the chance to have some play time. 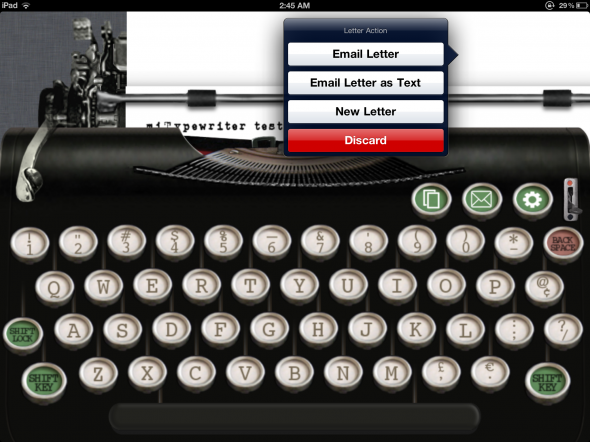 Teruaki Onoda of white dev, the guys behind miTypewriter, has been so generous and has given us 10 codes for the app. Yes, 10 codes to give away to writers who miss the clickety clack of typewriters. TEN winners will be selected at random from the commenters on or around 10:00 pm EST on Friday, June 1. Winners will be notified via Twitter, after which we’ll send the code through DM. Don’t forget to thank @white_dev if you win! Important: You can enter the contest once per day between now and the 1st. 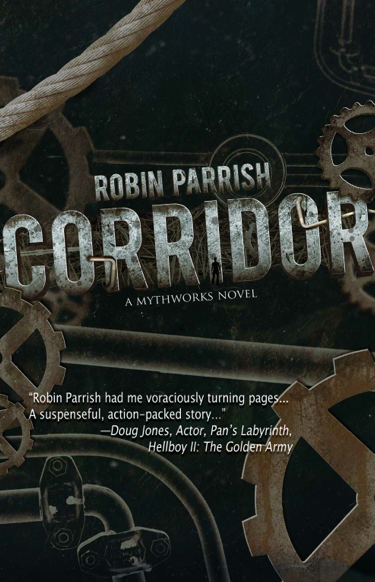 Get an Electronic Copy of “Corridor” by Robin Parrish for FREE! I believe that writers need to continue to improve themselves, and one way of doing that is to read, read, and read some more. When it comes to reading, I can read practically anything (except fashion magazines, maybe), but I do love a good fiction book. And speaking of fiction, did you know that we have a published fiction writer in our team at Splashpress Media? Robin Parrish is a journalist, blogger, and author. He contributes to our sister sites ForeverGeek and Apple Gazette. He has been so kind as to offer an electronic copy of his latest novel, Corridor, to you guys. Corridor is an action novel that keeps you at the edge of your seat. Here’s an idea of the story. THE ONLY WAY OUT IS TO RUN. On the eve of his seventeenth birthday, Troy Goggin finds himself inexplicably transported to an impossibly huge, miles-long structure called the Corridor. But what is the Corridor, and why was he brought to it? It’s a place of mystery, wonder, and heart-stopping danger. It will test him and push him both mentally and physically. His only companion is the girl whose voice he hears inside his head, explaining the rules he must follow if he hopes to escape. But there is much more to this extraordinary place than Troy could ever imagine. The Corridor’s true purpose — the biggest mystery of all — is revealed only to those who make it to the end. You can read excellent reviews of the book at Good Reads. I have started reading Corridor, and I find it riveting. I can tell you this for sure: you just might not want to start it if you do not have time to finish the book! So who wants a copy? Here’s how to join. ONE winner will be selected at random from the commenters on or around 10:00 pm EST on Thursday, May 3. Winners will be notified via Twitter, after which you can send us your email so Robin can give you the book. Don’t forget to thank @robinparrish if you win! Important: You can enter the contest once per day between now and the 3rd. Happy tweeting, and good luck!